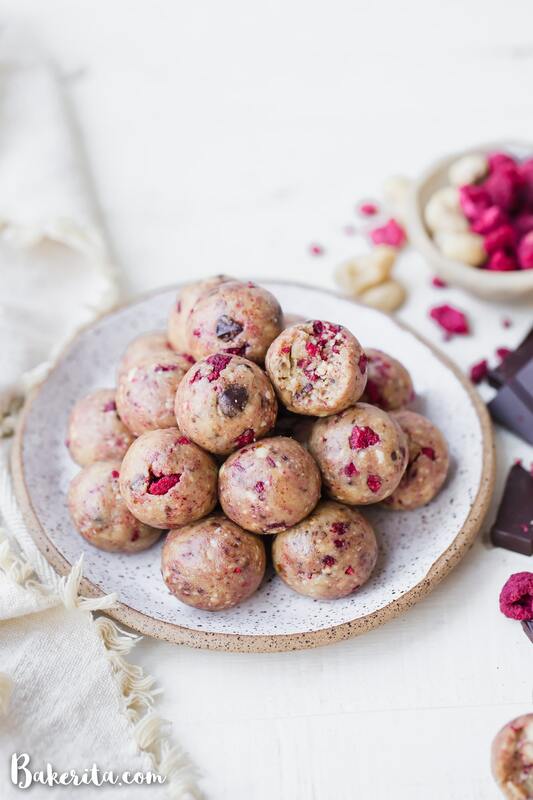 These Raspberry Dark Chocolate Energy Bites are deliciously filling and laced with the bold flavor of raspberries and shards of dark chocolate. They make the perfect gluten-free, paleo, and vegan snack or treat. Happy New Year, my lovely friend. I’m having a hard time grasping that it’s 2019 already. 2018 was a big year for me – one that flew by, but also seems to have had so much packed into it. I got Hank (the furry little love of my life), ended a relationship, started a new one, visited the wilderness of Alaska and traveled to New Mexico and Joshua Tree (and a few other beautiful places), was interviewed on a few podcasts, and had a wild ride pertaining to some exciting work projects (on which I’ll share more details soon! )…and so much more, in the days between the big moments. It’s a year I’ll treasure. But let’s start 2019 off with a bang, yes? I’m not one to make resolutions, per say – mostly because I’d rather set an intention when I feel inspired to, rather than the world telling me “time to make that resolution now, that you’ll forget about in a few months.” Instead, I pick a few words that I want to reflect the year ahead of me. I think 2019 will be a year for gratitude, inspiration, and self-love. Honestly, these have been themes of the past year too, and they’re ones I want to continue to pursue. To start, let me say I am so immensely grateful you’re here. 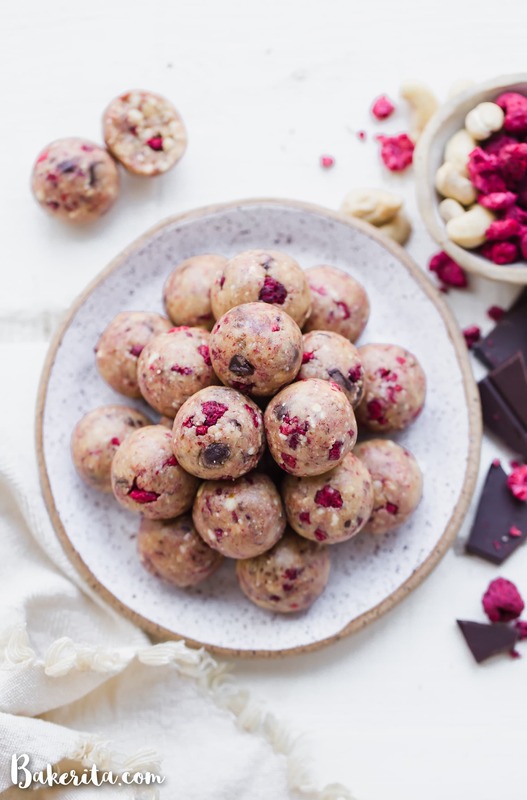 I’m also grateful for these raspberry dark chocolate energy bites (but moreso grateful for you!). 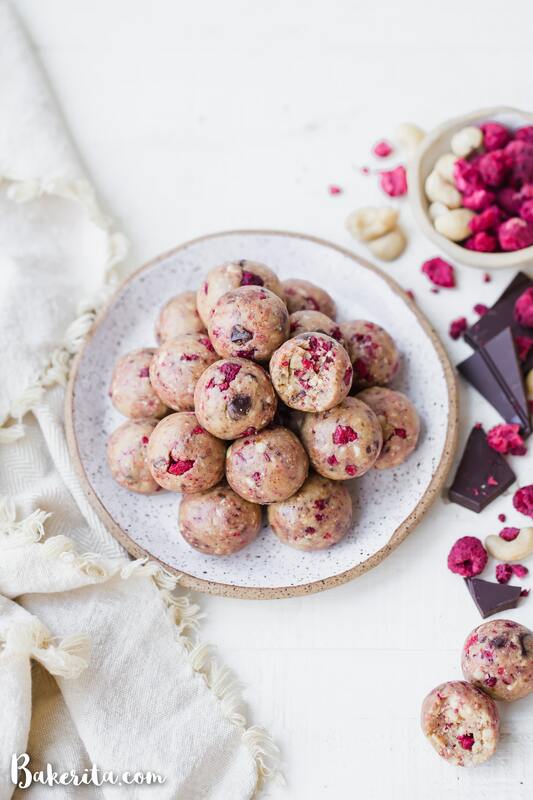 Let’s talk Raspberry Dark Chocolate Energy Bites! The inspiration to create these came about while working on something different. I had the idea, but doubted I had freeze-dried raspberries on hand. Then, I opened up a drawer to see them staring right at me. 15 minutes later, I popped one in my mouth, delighting over the beautifully paired combo of raspberry and dark chocolate. The tart fruity flavor of the raspberry perfectly complements the rich, slightly bitter flavor of the dark chocolate. 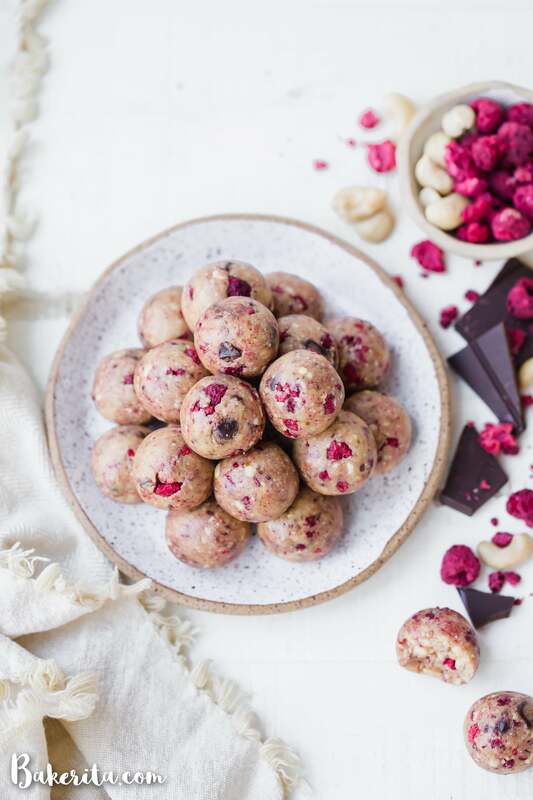 With a creamy base of cashews and cashew butter (though you could definitely sub almonds & almond butter), laced with vanilla, and sweetened with dates, I hope that these raspberry dark chocolate energy bites will put a smile on your face, the way they do mine. Enjoy! 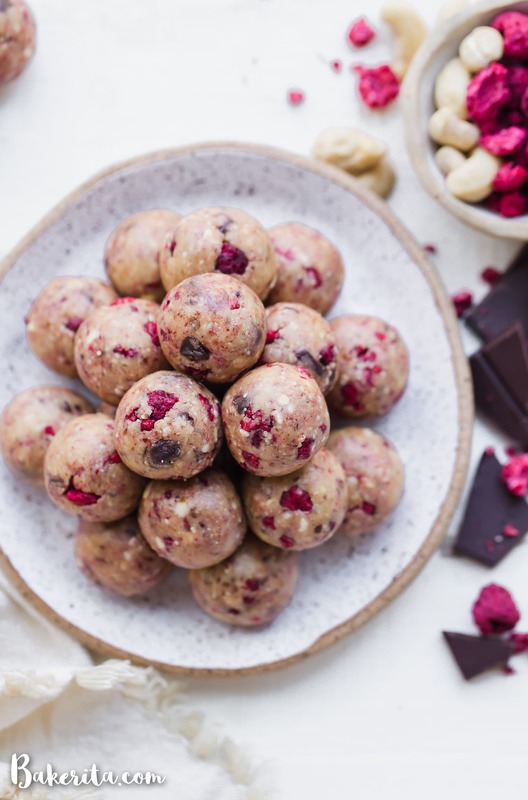 In the bowl of a food processor or a high-powered blender (I used my Vitamix), combine all of the ingredients except for the freeze-dried raspberries. Pulse for about 1-2 minutes, until the mixture starts to break down. It will first become powdery and will stick together, but still be crumbly. Keep processing until the oils start to release a bit and the mixture sticks together easily - just be careful not to over process or you’ll have nut butter. If your mixture seems a little dry, you can use a little extra coconut oil to help it come together. Once the mixture is sticking together well, pulse in the crushed freeze-dried raspberries and dark chocolate, just to incorporate them. You can also stir them in if the mixture seems too thick. Use a small cookie scoop (I use this one, which holds 2 teaspoons) or a tablespoon scoop to divide the mixture into equal pieces. Use your hands to roll into balls and place on a plate or in a storage container. Store in an airtight container or a zip-top bag in the refrigerator for up to 2 weeks or freezer for 3 months. So excited to make these? Would you happen to have the calories for 1? These look so good. Thanks for sharing this amazing recipe. Well, dang! I have all this stuff in my pantry right now except for the freeze-dried raspberries! I will definitely have to make these on the weekend. I just made these for the first time. I struggled with the combined ingredients being too dry to form balls well. Does anyone else have this issue? It may be the natural peanut butter that I used. I may try cutting back on the protein powder and adding a mashed banana next time to see if I can get the moisture right. Hi Nova, I use natural peanut butter too but if it was a less oily kind, that could be the issue! Did you add protein powder? Because that would definitely absorb a lot of liquid and make it too dry. As the recipe mentions, you can always add a little coconut oil (or dairy-free milk) to help the balls come together if they’re too dry. Hope this helps! Can you use frozen raspberries? No, unfortunately not – it will add a lot of extra moisture and completely change the recipe! Would love to see the nutrition facts label on these. They look yummy and I will definitely try making them. Hi Key, I just added nutritional facts to the recipe! Note that these can vary based on brands used and the size of your energy bites. These look so delicious. I love raspberry and chocolate together. I can’t wait to make these as an after school snack for the kids and I.